This pillow is big and firm would recommend it to anyone. Cuddling your pillow has never been easier or more comfortable. 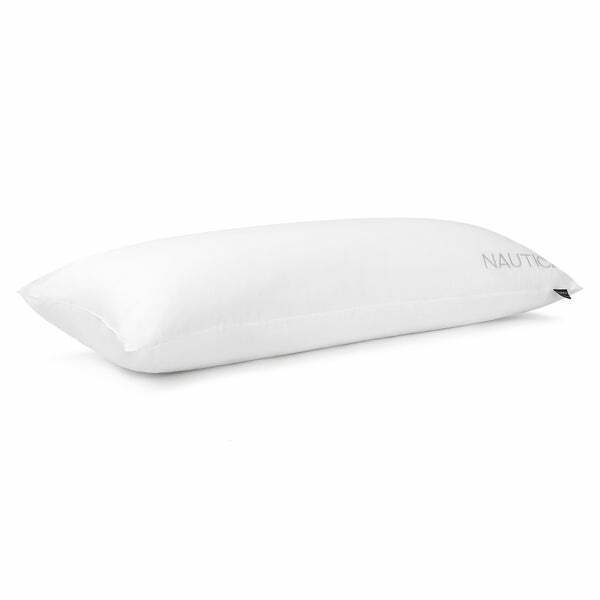 This AAFA certified body pillow has a 233-thread count, 100% cotton cover that has been embroidered with the Nautica logo and encases Dacron Memorelle Polyester Fiber, which mimics foam, but doesn't get hot. Memorelle continuously conforms to you head and neck no matter how much you move and has endless loft. It is fully adjustable to any sleeping position and is odorless, unlike traditional foam. The Asthma and Allergy Foundation of America has certified this pillow to be allergen free and safe for those who suffer from asthma or allergies. To keep your pillow fresh and clean, machine wash. This product has been filled and finished in the USA of an imported shell. Dimensions 52.0 In. X 20.0 In. X 7.0 In.